This hardy biennial member of the sunflower family is to be grown for something different and is not usually seen on the supermarket shelf. It is also known as the ‘vegetable oyster’ because of its similarity of flavour. It is a versatile, though little known, vegetable growing to 1m tall. The blackish skinned, white fleshed roots are about 20cm long and about 4 cm thick. The young leaves, stalks, shoots, flowers and their buds are also edible. Their growing needs are the same as carrots, needing fertile, deep, light soil. Seeds are sown in their growing position in spring, 1 cm deep in rows 20 cm apart, thinning out to 10cm apart. They need regular watering and are rarely affected by disease. 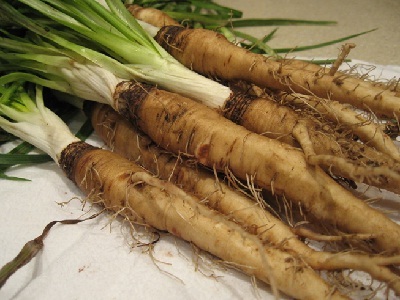 The roots need four months to develop and may either be left in the soil through winter until needed or eaten fresh. If the leaves and shoots are to be eaten, the plants should be covered in spring with about 15 cm of straw, the young blanched leaves will grow through. If the flowers and buds are to be eaten, the roots should be left uncovered until the following spring or early summer. The unopened buds should be picked when the stems have grown about 8cm.